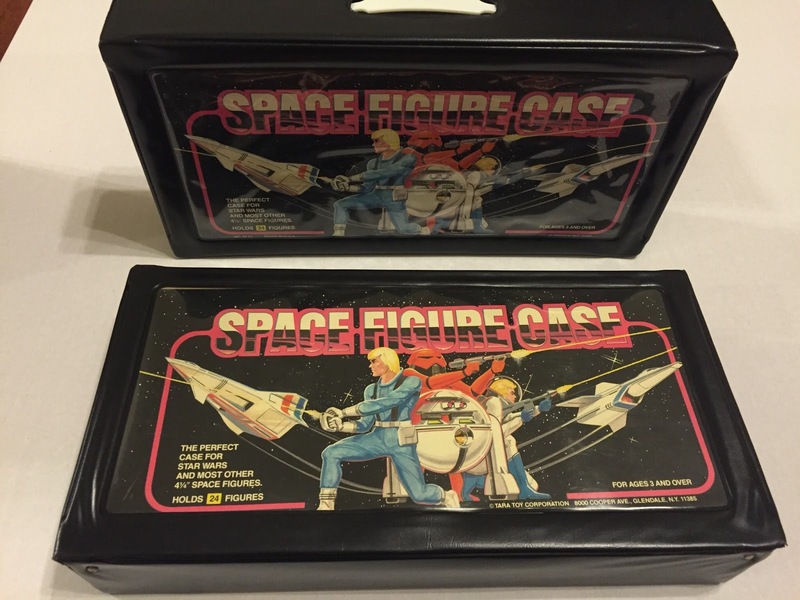 I've always enjoyed the cheap-o unlicensed "space figure" carrying cases that proliferated during the vintage era. 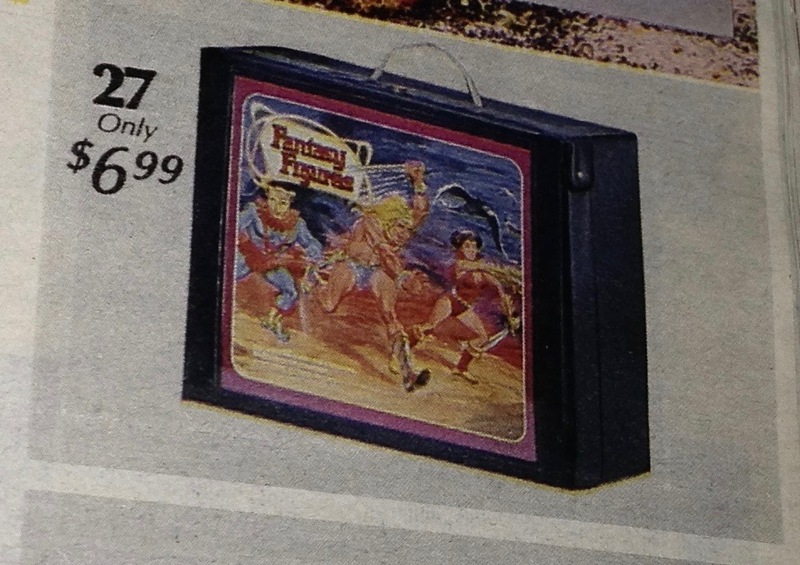 Marketing-wise, they bet everything on one eventuality: That parents, particularly those lacking in wealth and refinement, could be persuaded to forgo Kenner's licensed carrying case in favor of a flimsy knockoff. After all, what is the misery and embarrassment of a child beside the opportunity to save $3.50? The strategy must have succeeded, as there are quite a few of these things out there, all of them rather strange and delightful. Jason Thomas has been collecting this material for quite a while, so I asked him to put together this brief overview. You might say he accepted the case, flimsy trays and all. In 1979 or 1980, companies started making figure cases for Kenner-produced figures, but with artwork that was not strictly Star Wars. Yet it reminded you of Star Wars, and encouraged you to use the products with Star Wars toys. These cases might be described as bootleg, off-brand, or unlicensed. 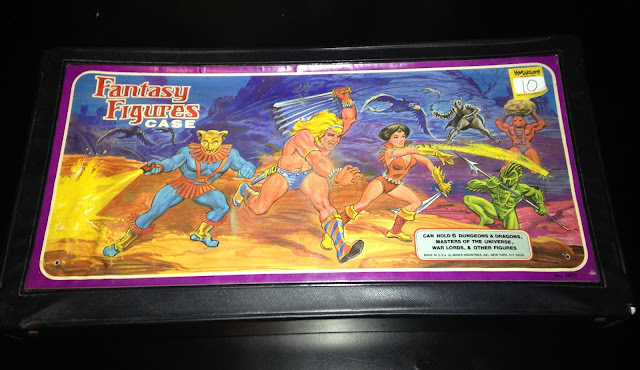 Somewhere around 1980, my Aunt Linda bought me a case that held 12 figures. 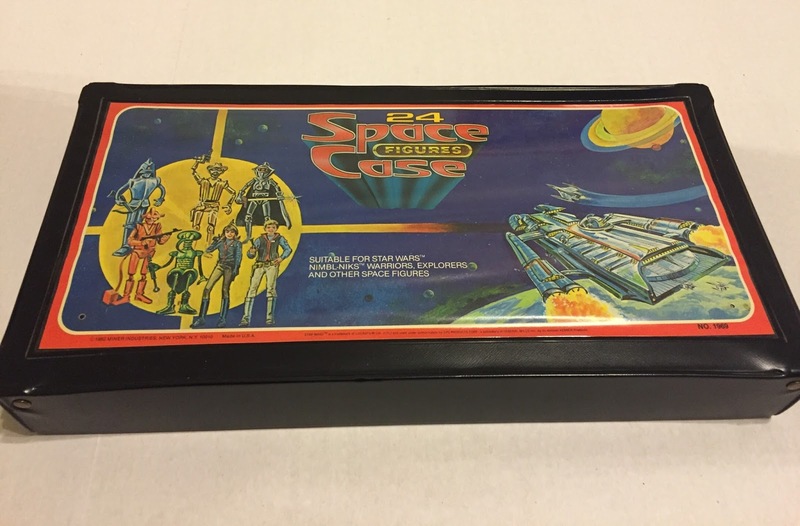 It was called the Star World Figure Case, and it was produced by the Tara Toy Corporation of Glendale, New York. JASON: What kind of case is this? AUNT LINDA [attempting to use Jedi mind trick]: That is a Star Wars case for your figures. All I said was "thank you" as I stared blankly at it. I was processing my confusion. The characters in the cover art reminded me of Star Wars characters. But they weren't -- they were impostors. 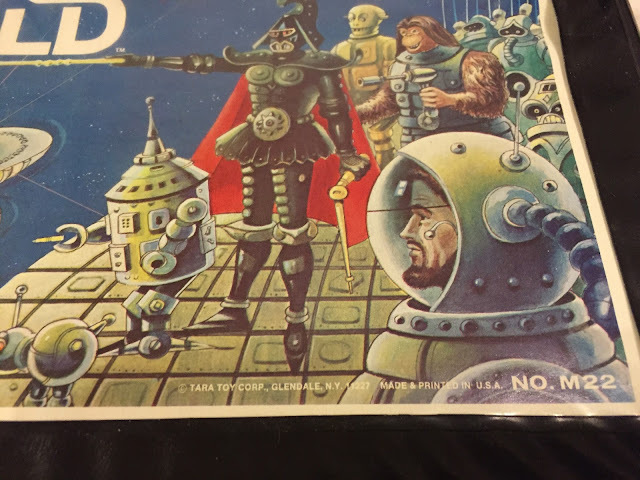 During the first year I owned it, I can't tell you how many times I looked at that strange Darth Vader robot in the artwork. I didn't know it then, but that was my introduction to bootlegs. So from there forward it was my fake case -- the case I wouldn't show my friends because I would then have to explain it. And I didn't want to do that, because I didn't really understand what it was. I used it for storage, but when I showed my figures to my friends, they were in my Star Wars case made by Kenner. My grandparents bought me that one. No Jedi mind trick required. Fast-forward to the 2000s. Between the few cases that I had stumbled onto through eBay over the years plus, later, the ones that friends Thomas Quinn and Ron Salvatore turned me onto, my collection and love for the unlicensed space-themed action figure case has grown to the point where I cannot see my vintage Star Wars collection as being complete without them. It's likely that the earliest of these cases were made starting in 1979 or 1980, coinciding with the huge success of the Kenner Star Wars line. In my opinion, the first company to jump on the coattails of Lucasfilm and Kenner was the Tara Toy Corporation of Glendale, New York. They created cases for GI Joe, Star Wars, Barbie, Matchbox, and other lines, all of them unlicensed. The Barbie case was called something along the lines of Fashion Doll Bedroom Case; the case for Matchbox toys was called something like Garage Carry Case. Where Tara's space cases were concerned, there were several versions, each bearing one of three types of artwork. Of course, there was the Star World Figure Case mentioned above. It held 12 figures and bore text stating, somewhat ironically, "Star World is a registered trademark of M.A.C. MFG. CORP. used by permission." 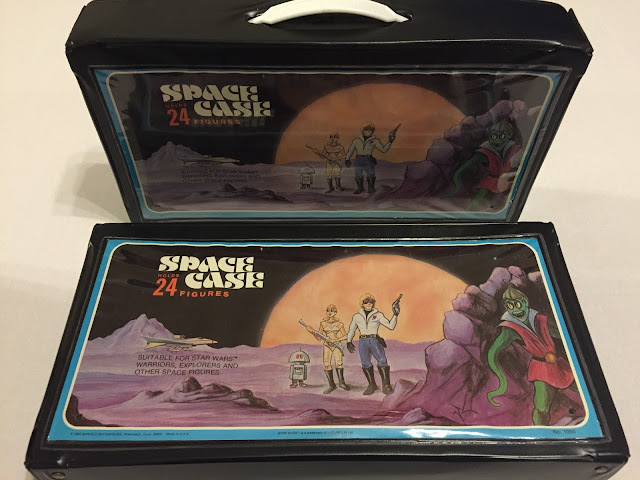 But Tara also made the more common Space Case Figure Case, which came in versions holding 12, 24, and 48 figures. The latter is the most difficult to find -- a sort of Grail piece. 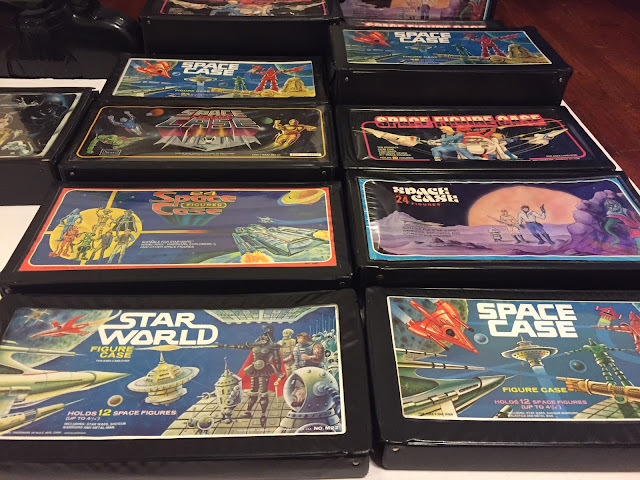 All of these advertised the fact that they could be used to hold Star Wars, Shogun, Battlestar Galactica, and Metal-Man figures. 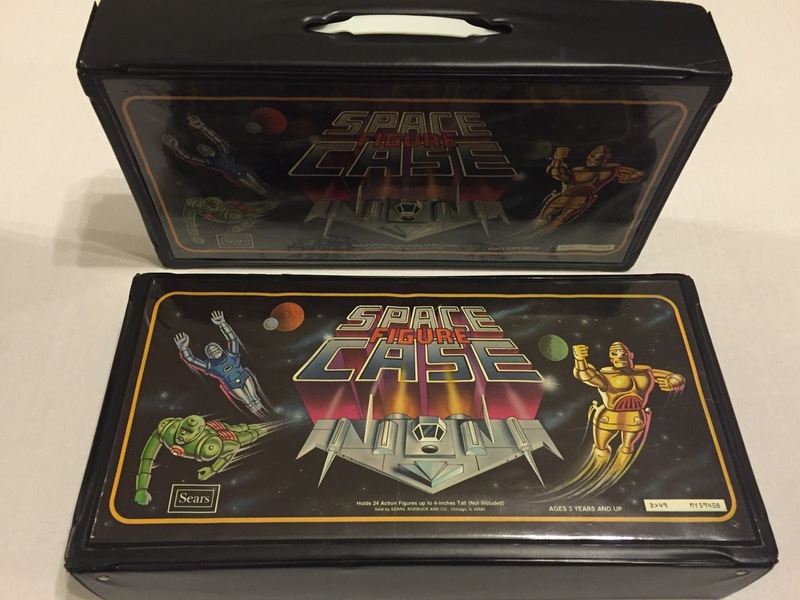 There was yet another Tara case, also labeled Space Figure Case, but with unique artwork. It held 24 figures and had a design as reminiscent of Buck Rogers and Flash Gordon as Star Wars. Another 24-figure-capacity Space Figure Case was produced by Sears in 1983. This one held no mention of Star Wars or Lucasfilm, possibly because the artwork featured several flying robots and a Snowspeeder-like ship, neither of which was easily confused with the Star Wars line. In place of the words referencing Star Wars and other licenses was text noting that the case was for "...Figures up to 4-inches Tall." 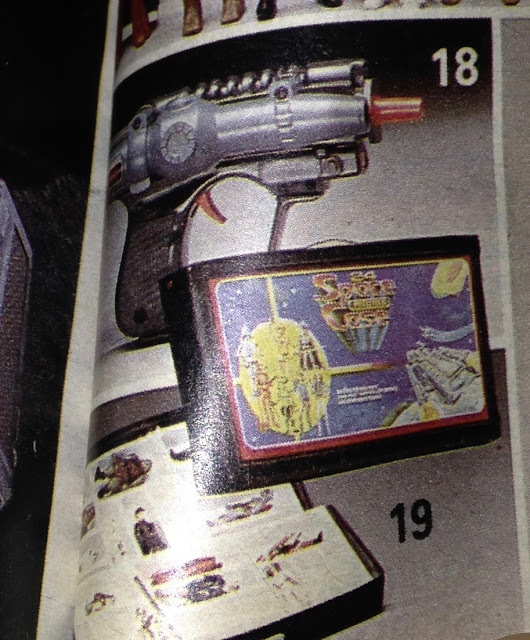 The Sears Christmas catalog of 1983 heralds the Space Figure Case as a Sears exclusive. Note the Star Wars figures unhappily resting in those cheap trays. In 1982 and 1984, two other companies, both of them situated curiously close to Tara, released unlicensed cases. 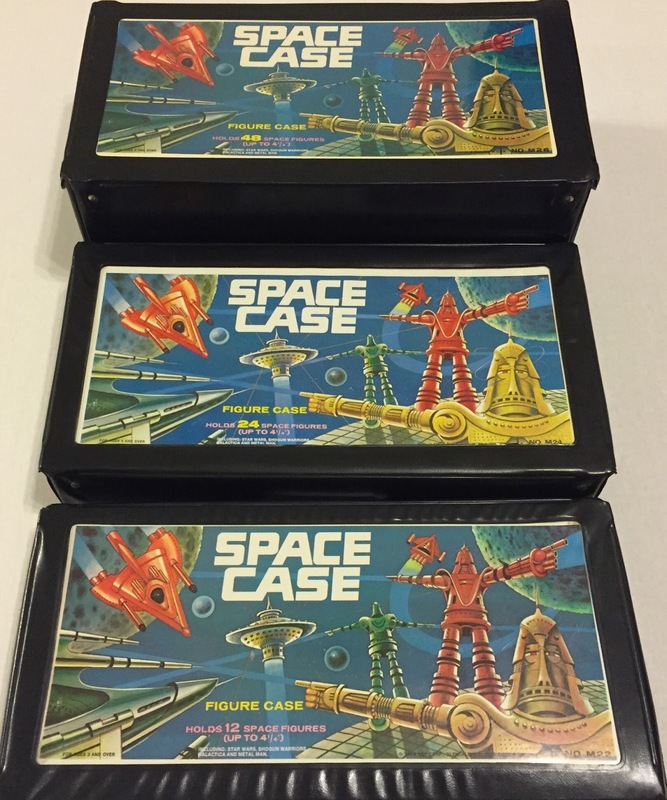 The first of these was the 24 Space Figures Case, produced by Miner Industries of New York City; the second was the Space Case, from Baroco Enterprises of Greenwich, Connecticut. Both of these cases were built to hold 24 figures and featured, in small writing on the bottom of their covers, reminders that Star Wars as a property belonged to Lucasfilm. The Miner case even claims that the company's use of the trademark "Star Wars" was authorized by CPG, the parent company of Kenner! The 1984 Sears Christmas catalog -- "Not licensed by Lucas Films, Ltd." Not licensed by Lucasfilm either, I'd wager. Now, I have a hard time believing this was approved by Lucasfilm. The catalog advertisement even says it was not licensed! If that was the case (pun intended), why pretend it was an official product? Some of my favorite idiosyncrasies regarding these two cases concern the trays that came with each of them. 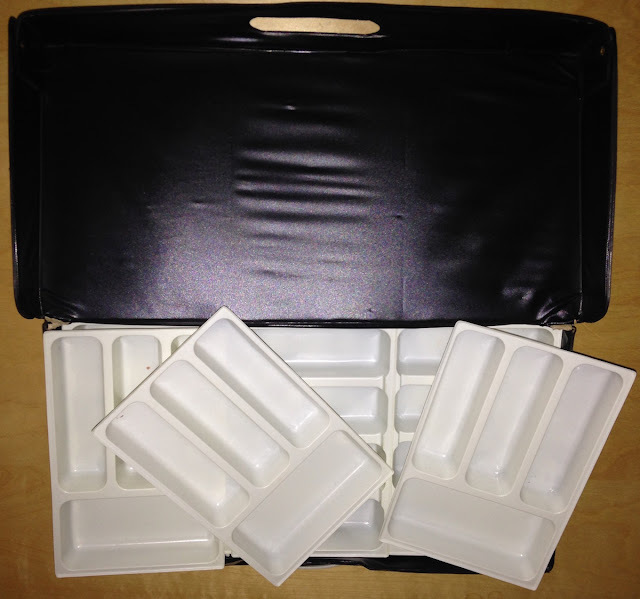 The Baroco and Miner cases had six white trays, three for each layer. They bore similar designs, though the Miner trays are much thicker. Of course, previous owners of these cases could have switched the trays around, making it hard to know with certainty which tray came with which case, but it's my opinion that the Miner and Baroco companies were connected in some way. For the most part, the trays that came with unlicensed cases, regardless who made them, were brittle and prone to cracking on the edges no matter how careful you were. They were never rigid and durable like those that came with Kenner's vinyl carrying cases. Interestingly, the Miner case, although it claimed to hold 24 figures, and had two layers of trays with three trays across, was not as deep as any other 24-figure case. In other words, it was thinner than it needed to be to do the job advertised. At just 2" deep as compared to the 2 5/8" of the Tara and Baroco products, this case could not fit 24 figures without bulging. Perhaps by advertising that it carried 24 figures, even though it was smaller than its competitors, Miner Industries sought to make more money by saving on shipping and material costs. Lastly, there are rumors of a silver Space Case, which I have not personally seen, and there was a Fantasy Figures Case, also made by Miner. The Fantasy Figures Case featured amazing artwork, and might be attractive to the collector who wants to extend his focus beyond strictly space-related fare. It is, however, quite rare. The Sears Christmas catalog featured the Fantasy Figures Case in both 1984 and 1985. The differences in these cases and the creativity of their artwork are what make them interesting. As they're from the vintage era, and were used with the vintage toys we love, I view them as a wonderful part of that toy family.